Imagine you are the pilot of an airplane. One or more of the engines have failed and you have to find a place to land. Being able to function successfully and making the right decision in such a situation could mean the difference between life and death. 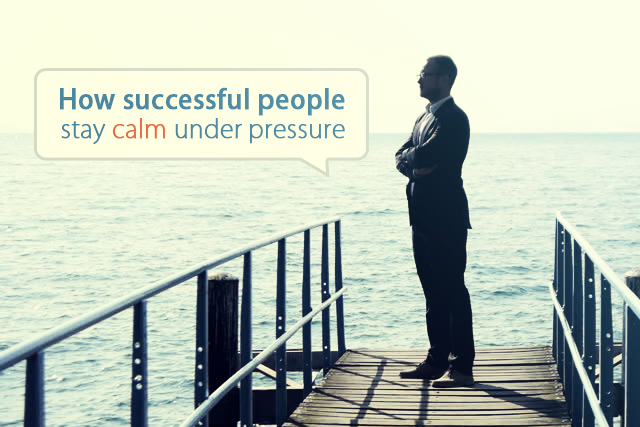 Neuroscience has revealed that remaining calm under high pressure situations is not an inborn trait, it is a learned skill which anyone can acquire. Communication with colleagues at work or family members at home, there are always some thoughts and ideas which we will directly convey to other people. There will also be beliefs and conclusions which we can directly voice to other people. These may be our own personal opinions and reflections. It is this undeclared personal assessment which sometimes leads a person into a feeling under pressure. Depending on how dearly we value each one of these silent feelings the situation may get out of our hand. Before trying to confront the situation based on highly influential emotions, it is important to understand the situation objectively. Take a step back and exclude yourself from the situation. Try to look at only the facts and reality. Do not think of all the things that could have, would have or should have happened. Instead try to focus directly on the dilemma at hand, disassociate yourself from the situation. Sometimes we have held back on our feelings for so long that they may show up their ugly head in an unwanted way and make the entire situation even worse. Now try to understand all the FACTS that are associated with the incident without associating emotions. Making emotional decisions can have serious long term repercussions which we will begin to regret. “When you change the way you look at things, the things you look at change.” These are the words of the German quantum theorist Max Planck, who was also a Nobel Peace Prize winner in the year of 1918. In life, if you approach any project with a clichéd negative approach, you will seldom produce any positive results. Perseverance is the fundamental key but attitudes also play a huge role in success. Successful people understand that anger is contradictory to success. They refrain from making impulse decisions based solely on their feelings of resentment and outrage. Making such enraged decisions may give them temporary satisfaction for the time being. But in the long run they will be more destructive. The foundation of a good decision lies in evaluating the pros and cons of a situation and based on sound judgement. There is no room for emotions when making consequential future judgements. Science has conclusively proven that caffeine does in fact affect our brain and the way we will approach our next state of affairs. Caffeine is not all bad. There are certain limits of caffeine which will actually make an individual more productive with heightened awareness. But excessive use of caffeine or any other stimulant can have adverse effects on the body and it will cloud the decision making process. So you have to ask yourself with other beverages and coffee, how much is too much? It is advisable to limit your coffee intake and instead of turning to coffee or any other beverage to help you face extraordinary circumstances, use it to help you relax. Excessive use of coffee throughout the course of the day can have a damaging effect on sleep patterns. Contrary to popular belief adults also need to get a healthy night’s sleep to function productively throughout the course of the day. Regardless of what are your goals and intentions, everyone faces criticism in life. There will always be people who think they know it all. They will be more than willing to provide their advice free of charge. All the time this advice will always be negative ideas and comments. From family members to friends and even colleagues and associates; everyone will concur that you will need assignment assistance one way or the other and that you cannot do it all by yourself. Charles Darwin, Marie Curie, Albert Einstein, Thomas Edison and Mark Twain were all people who maintained an intricate daily diary. There are times throughout the day when we have some of our best ideas. The instances when we do get the best ideas we are often busy doing something else. A person might get a brilliant future investment idea while gardening or travelling. At the time it might not seem important and the person is already entwined in a productive activity. Prosperous personalities understand the significance of each and every idea that comes to them throughout the course of the day. Writing in a daily diary captures each idea you had in the course of the day which would have otherwise been lost in the mindless daily anarchy. There are some ideas and thoughts which we cannot express to anyone but ourselves. Keeping a diary helps soothe the mind as you have personally addressed your feelings in your diary about how you feel about a particular person or concern. Previous PostPrevious Why Taking Time for Yourself and Meditation Is Not a Selfish Act?